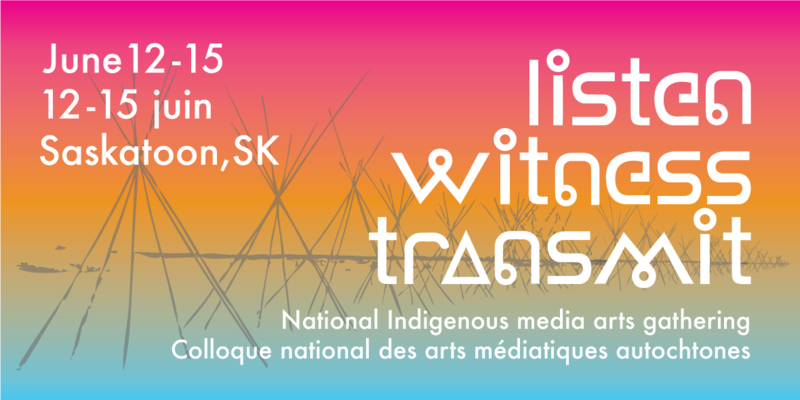 The Independent Media Arts Alliance (IMAA) in partnership with the National Indigenous Media Arts Coalition (NIMAC) are pleased to announce that the National Indigenous Media Arts Gathering 2018 will take place June 12-15, 2018 in Saskatoon, SK. This joint NIMAC-AAMI Gathering will address concerns of the Indigenous media arts community in Canada. Speakers’ lectures, round tables, workshops, presentations, exhibitions and film screenings will be on the agenda. Entitled Listen, Witness, Transmit, each day will employ a resurgence practice: the first day – Listening, the second day – Witnessing, and the third day – Transmitting, to build momentum that informs Indigenous pathways of continuities, resilience and relationships through art, the community and the collective. The gathering will be an opportunity for cultural workers in the field to build their national network with the view of strengthening independent media arts organizations and collectives. Events will take place at Wanuskewin Heritage Park, about 15 minutes outside of the city, along with satellite programming in various venues in Saskatoon including Aka Artist Run Centre and PAVED Arts. The National Indigenous Media Arts Coalition’s (NIMAC) priority is to support, promote, and advocate for Indigenous media artists and arts organizations within the context of Canadian media arts practices. We connect Indigenous artists to not-for-profit arts organizations on a national scale. NIMAC is a permanent region within the structure of the Independent Media Arts Alliance (IMAA), acting as the Indigenous arm.